I recall very clearly the first time I saw an episode of Toopy and Binoo. My daughter was still a baby so the current world of kid’s television programming was pretty new to me. I can honestly say that when I first saw the show I didn’t get in on any level. A giant rat, his best friend the speechless stuffed cat and his ever present security item, a beat up green stuffed, ummm, thing. I found the characters annoying and overly “childish”. At first. My daughter took an instant liking to the show. So, I was forced to watch but, surprisingly, instead of growing to hate it, which I fully expected, I actually grew to rather enjoy Toopy & Binoo. Toopy and his never ending enthusiasm and positive reinforcement is actually quite endearing. And Binoo and his never faltering love and patience for his over imaginative, definitely ambiguous and dangerously spontaneous best friend is, well, rather lovely. The lessons these strange little creatures bombard our infatuated toddlers with are simple, and fantastic. Here you will find an online game and about a dozen Toopy & Binoo coloring pages you can print. PBS Kids has a pretty good selection of online Toopy & Binoo games and some cool printable activities and crafts. This is the place to visit to find out information on the Toopy & Binoo live tour. I’m not sure how often they they do the show but it was just here in September. I’m not really sure who runs this page. It links to the Treehouse site but I’m not clear if that who is actually administrating the page. There really isn’t a lot going on there, despite having over 55,000 fans. If you browse their photo section you will find some coloring pages and other printable activities. They occasionally run giveaways that are, well, annoying – making you come up with a dozen referrals for a chance to win a small prize. I have heard however, that the people that were successful did receive their prizes. This is Canadian manufacturer and online store that has a few Toopy & Binoo toys and accessories for sale. I have bought one of their items, the hunt and seek game, at Giant Tiger and the quality is decent for the price. I have not ordered online so I can’t comment on the shipping or reliability. Another online store that carries a selection of Toopy & Binoo toys and what not. It looks like most of the items are made by Gladius. Again I have no experience ordering from them. One more online Canadian retailer that has a few items. Same items as the previous two online stores but a smaller selection. Not a lot of Toopy & Binoo items here but they do carry a handful of books and are a great store to deal with. I was thrilled when iTunes starting carrying episodes of Toopy & Binoo. I was able to keep a few episodes on my iPhone and iPad for “emergency” situations with the little one away from home. You will find a selection of items – DVDs, books and toys. I find the prices pretty ridiculous, with the exception of books and DVDs which are average. This is probably your best source for Toopy & Binoo products. The are primarily from Canadian sellers which is nice and many of them are reputable with good feedback. The prices can get a little steep but there are decent deals to be found if you look for them. I’ve bought several items including clothing, books and stickers and have been quite happy with them. Etsy has a few vendors selling various Toopy and Binoo items. Most are handmade, some are nice, I would guess that none of them are licensed. Chapters, Future Shop and Bestbuy all carry Toopy & Binoo DVDs online. If you keep your eyes open you might find things pop up in stores here and there. I have found Toopy & Binoo books at the dollar store and recently bought a game at Giant Tiger. So, fabulous you, do you have a little one who has gone through a Toopy & Binoo infatuation? Did it last long? What do you think of the show? I’d love to hear your thoughts! I have a lot to learn with this kids shows now that Carter is showing an interest, or should I say a lot of patience to learn? You can't go wrong with classic Sesame Street though! I still love it!!! We still love T&B in my house – and my oldest is almost 6. She doesn't mind watching it because it brings her little brother so much joy!! Thanks for the run-down of T&B resources. To MommyOutside – we watch Treehouse or Disney Jr. too, but you should try some TVO shows. We just discovered Rob the Robot and, for school-age children, Wild Kratts. AWESOME! LOL it's definitely a Canadian thing Theresa! Oh yes I know that episode well! TVO – I'm assuming that's in Ontario? I'll have to check out their website thanks! Hi Danielle. There are tons of Toopy and Binoo links in the post! My name is Frank, and I do the voice for the Toopy and Binoo TV Series, as well as puppeteer and Toopy on "Vroom Vroom Zoom!" I also perform a live version of this show, custom tailored to your child's party! I use the same puppets as we used on the TV series. I'm always happy for the chance to perform the show for young fans!!! 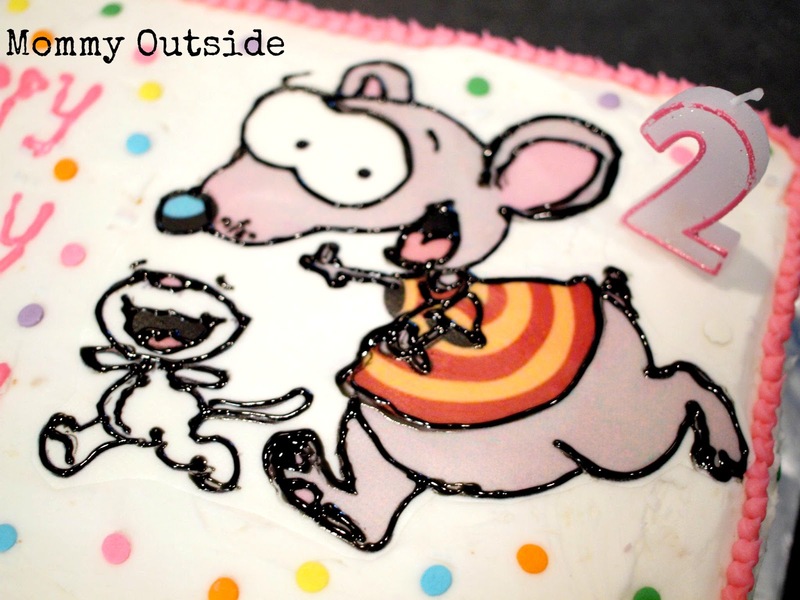 Does anyone know where you can get a Toopy and Binoo birthday cake in the Toronto area (GTA)?